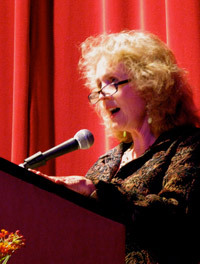 Lee Smith gave the annual John Hersey Memorial Address to open the second session of the 2008 Seminar. In a talk that was both extremely funny and unexpectedly moving, Smith recounted her development as a writer when, as a young girl, she would write herself into Nancy Drew and Bobsie Twins adventures. Smith talks about how, after her initial obligatory autobiographical efforts, she discovered that she could find her voice though the creation of the wide variety of characters that she would imagine and create. She goes on to talk about the consolation and the rebirth that writing offered in the aftermath of terrible personal loss. Lee’s subtle balancing of humor and pain, leavened by her warmth and her sturdy, both-feet-on-the-ground sensibility, is truly affecting—this one kicked off the session with a lot of energy and soul. This recording is available for noncommercial and educational use only. All rights belong to the author. © 2008 Lee Smith. Used with permission from Lee Smith. Lee, I just discovered you! There was an article in the San Diego Unions April 11th edition about an author who had just published a memoir, “Dimestore”. The story was about this girl growing up in Grundy, VA whose father owned a five and dime store (Ben franklin five and dime). I grew up on Poplar Creek and Looneys Creek. I’m nine years older than you. Believe me, your story brought back some memories.I can remember them building and opening the store you mentioned. I met your father a couple times, neither worth mentioning. Probably would make a good story though. Anyway, I’m looking forward to reading the Dimestore story and rest of the stories you’ve written. I just listetened to your 1988 talk and enjoyed it very much.Hope you continue writing.